Mugabe Gone, What’s Next For Zimbabwe? Zimbabwean President Robert Mugabe resigned on Tuesday. Rachel Martin talks with journalist Peter Godwin, who was born and raised in the country, about where the country is headed. 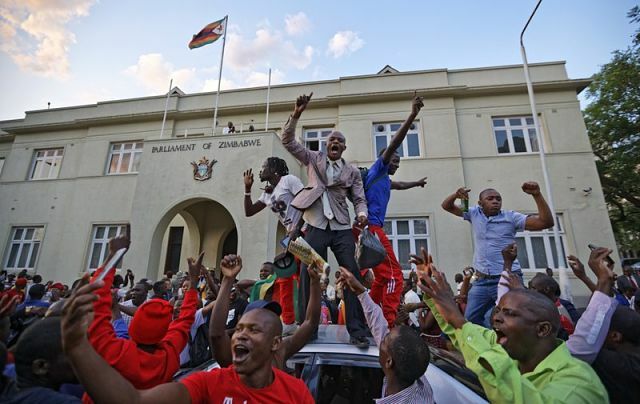 Zimbabweans were on the streets of Harare yesterday celebrating the resignation of 93-year-old President Robert Mugabe. MARTIN: Mugabe’s fall from power all started last week, when the military took him into custody. Lawmakers from his own party expelled him over the weekend. And Mugabe stepped down yesterday in the midst of impeachment proceedings. The tumult of the past few days, though, is unlikely to stop with Mugabe’s resignation. The country faces the prospect of an extended military rule or the rise of an even more violent leader than Mugabe. Peter Godwin is a journalist and an author who grew up in Zimbabwe, and he joins us now from New York. Peter, thanks for being with us again. MARTIN: Take us back to yesterday. This has been a slow burn in a lot of ways getting to this point when Mugabe actually resigned. What was going through your head when the news actually came down? GODWIN: Well, it’s been a slow burn. It’s been an even slower burn insofar as it’s taken 37 years. That’s how long he’s been in power. And then, you know, a full week for this slow-motion military coup to play out. And I was, you know, I was on air at the time, you know, talking about Zimbabwe and trying to be sort of very kind of rational and analytical. And when he actually resigned – and I suddenly kind of – it kind of welled up inside me, and I broke down. And I realized that like a lot of Zimbabweans, we’ve waited so long for this and this. And this man, Robert Mugabe, has cast this enormous shadow over so many of our lives for so long, that he’s had this kind of dead hand that’s been, you know, sitting on this country that prevented it from finding its full potential. Our initial reaction’s just one of enormous relief, just huge relief that whatever else follows, at least he is gone.